When it opened in 1892, Grady Hospital represented the most advanced principles and philosophies of medicine and hospital architecture. The city-owned and operated hospital was named for Henry W. Grady, a prominent Atlanta newspaper editor and proponent of the "New South." He and other leaders of Atlanta wanted a facility that would be free from all sectarian and denominational influences. When Grady Hospital opened, it welcomed rich, poor, black and white. The hospital was originally a connected series of Romanesque style buildings, but now only the three-story main building survives. The wards, outbuildings and one-eighth mile of connecting corridors were demolished in 1959 to make way for a parking lot. The brick main building rests on a basement of solid granite. Facing west, the main facade has a one-story portico flanked by a set of paired windows and set of tiered windows. 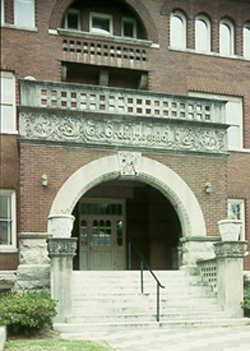 The large round arch of the entry portico is detailed with an egg-and-dart molding and carved keystone. An ornate frieze with the name of the hospital runs around the three sides of the portico and is topped by a concrete balustrade. Above the portico are recessed center windows on the second and third floors. Granite brackets above the second floor bring the third-floor balcony of open brickwork flush with the facade. On the north side of the building is the tower with an enclosed fourth level housing an emergency water tank. Its fifth level is open and originally housed the emergency bell. The bell was replaced by chimes in 1900. The interior of the first floor features a wide hall dividing the first floor from side to side and another hall crossing the building north to south, separating the main entry from the rear of the building. The second floor was designed for 10 private rooms for paying patients. Although the hospital was provided with steam heat from its own plant, six of these rooms had working fireplaces. The rooms were built with rounded corners in the belief that it was more sanitary. The nurse and staff quarters were located on the third floor. In 1903, a new operating room was attached to the northeast corner of the main building. Ten years later, a new six-story hospital building was connected to the main building through the small emergency room wing. Except for these two major changes, the exterior of the main building remains intact. The main building of Grady Hospital is located at 36 Butler St. in Atlanta. 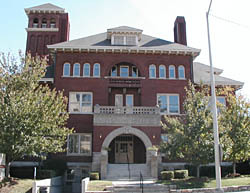 It is currently Georgia Hall, the hospital's Human Resources Department, and is not open to the public.